Mondays seemed to have turned into a long list of need to get done tasks, including cleaning house which seems to take up half the day. Plus feel like I'm working on less sleep lately. The man that used to be asleep by 10, getting annoyed if any noise woke him up has now become a night owl. Keeping us all up with his bright light. Weird but those moments sometimes make me miss being single. Overall the weekend was fun. 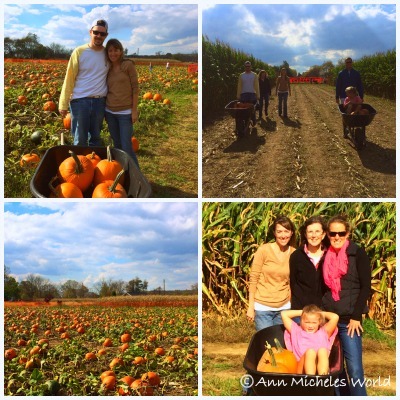 Saturday involved pumpkin picking at a local farm, followed by a family party for my mom's birthday. Of course the day started off with a vertigo attack, but it remained on the mild side for most of day. Had to be careful how I moved and could not look down or else everything was spinning. Just grateful I was able to go and enjoy the day as often times attacks leave me bed ridden. Other than it being a little windy the weather was perfect! The evening was capped off with a delicious dessert. Golden Oreo ice cream cake which was seriously decadent. And it had no egg in it, perfect for those allergic to egg. Think it's a must have! Sunday involved trying a new slow cooker recipe. Stuffed cabbage which might be a new favorite of mine. Liked it so much I will feature the recipe on here this week for all to try. Of course football took up all of the day, overall there was a decent amount of lounging. Social media has seemed to be filled with photos of fall activities, love seeing how everyone enjoys Fall. Not to mention all the beautiful fall foliage photos as well. Though the weather is turning much cooler here something I'm just not ready for. Colder weather makes it so much harder to not only get out of bed but to get motivated. Meanwhile I'm feeling rather nervous about something which I'll talk more about tomorrow. For now I have a list of things that still need my attention.